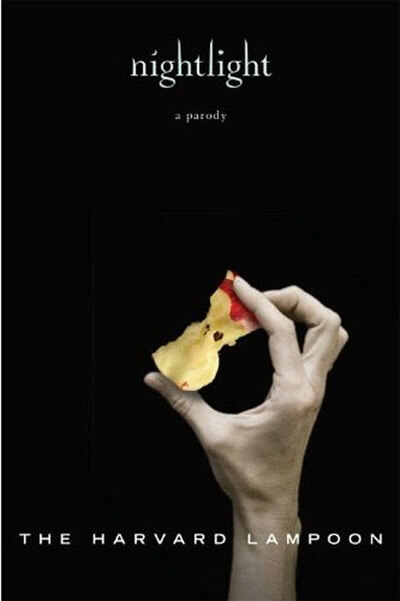 I love parodies of Twilight. I admit I enjoyed the Twilight series, but I’m realistic enough and well read enough to be able to realise what it is – not a masterpiece and possibly a very detrimental piece of fiction if taken to heart by adolescent girls. It’s a story full of dominating, abusive relationships, and generally puts women in a bad light which would be alright if it admitted to that rather than trying to take itself seriously as a love story, an innocent love story no less. Because of this and how popular it is I love anything or anyone that takes the piss out of it and is actually humorous. I think a lot of people try to take the piss out of something, but fail dismally because they’re trying too hard, which is why as much as I don’t mind parodies they can seriously irk me. I have enjoyed Nightlight by The Harvard Lampoon though. I enjoyed it right from the word go. I even get a chuckle out of the synopsis. Second, there was a vampire part of him – which I assumed was wildly out of his control – that wanted me dead. Pale and klutzy Belle arrives in Switchblade, Oregon, looking for adventure, or at least an undead classmate. She soon discovers Edwart, a super-hot computer nerd with zero interest in girls. After witnessing a number of strange events – Edwart leaves his chips untouched at lunch! Edwart saves her from a flying snowball! – Belle has a dramatic revelation: Edwart is a vampire. But how can she convince Edwart to bite her and transform her into his eternal bride, especially when he seems to find girls so repulsive? I love it because Edwart is afraid of cooties and not graceful whatsoever and Belle comes across as really, really self absorbed and delusional. They make references to Bella Swan in Twilight being a very obvious Mary Sue – Belle thinks she’s popular when she isn’t, Belle thinks everyone thinks she is remarkable and she thinks so of herself while pointing out she doesn’t wear make up or pay attention to fashion – and Belle being a bit of a nitwit. There’s also references to sparkly vampires, one of which involves glitter, stalker like behaviour, inept parenting, and one of my favourite of all is the reference to when (spoiler alert for those who haven’t read New Moon or watched the movie) Edward leaves Bella and the break up aftermath is emphasised with several pages with only the month on them to signify the months going by (spoiler alert ended). I did enjoy that in the series, but I love how it’s payed out in Nightlight. I also love how Belle’s father is distant after several years of being a window wiper and being separated from people by a windowpane. He is also the cause of Belle being a klutz because he used to push her down when she was learning to walk. There’s lots of references like that through out the book, all of which are silly and some quite laughable, but at one point it took a turn I was not expecting and for some reason there is a robot. I would recommend it if you’re a Twilighter who is fine with it being payed out or if you’re someone who can’t stand Twilight, but unfortunately got to know the story. There is one qualm I have about it though. It may be a novella and sure it’s only a parody and not serious literature, but that doesn’t mean the people who wrote it can’t take pride in their sentence structure and punctuation. Unless that’s the whole point, but I doubt it. It’s not overly distracting, but it is noticeable every now and then (or if you’re just pedantic like I am). That’s it! I’m buying it! It looked great in the store, but you know how I always get distracted by shiny covers and end up buying those instead? I think I will have to make amends and buy a copy. Im curious about the context of the robot……. Ooo goody! When you read it let me know and then I’ll re-read it so I can talk to someone about it. I started following Moeke around reading out lines to her lol. Probably only take you a couple of hours if that to read.